Are you sure those leftovers are still safe to eat? You may have forgotten how long the food has been in the refrigerator. This causes us to throw away food - that might still be good - because we are afraid of getting sick from it. Ovie solves this problem with their smart food storage products. Todd spoke with Stacie from Ovie at CES 2018. 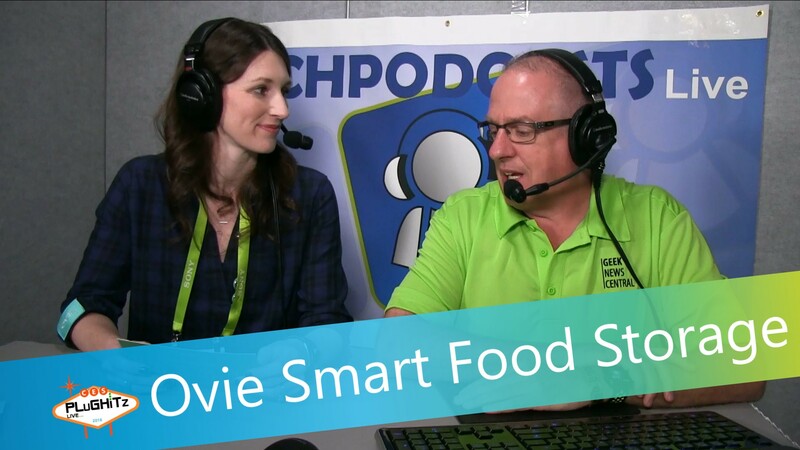 Ovie created Smarterware: smart food storage that is designed to help you track, remember and use the food that is in your fridge before it goes bad. It is a system of smart tags, containers, clips and bands. Put the tag on your food container and push a button. Tell your favorite digital assistant (Alexa, Google Assistant or Siri) to tell Ovie what is in the container. This will trigger Ovie to track the food for you for four days. A green light on the tag indicates that the food is still safe to eat. A yellow light indicates the food should be eaten soon. When that happens, you will get a notification on your phone reminding you to eat that food before it goes bad. In addition, you will get a recipe recommendation that uses that food and that is based on the foods that you already have at home. Ovie makes any fridge into a smart fridge. The Smarterware tags will retail for $59 for a set of three, and $89 for a set of three tagged containers. A Kickstarter campaign is planned to launch soon, and you can signup to be notified when the campaign is ready on their website. The planned delivery date for the product is Fall 2018.